The 2000 World Series, the 96th edition of Major League Baseball (MLB)'s championship series, featured a crosstown matchup between the two-time defending champions New York Yankees of the American League (AL) and the New York Mets of the National League (NL). The Yankees defeated the Mets four games to one to win their third consecutive championship and 26th overall. It marks, to date, the last World Series with a repeat champion. It was the first postseason Subway Series since 1956. The Yankees were in the World Series for the third consecutive season and fourth in the past five years, and 37th overall. This made it the most of any team in MLB. The Mets qualified to play in the World Series for the fourth time in franchise history, making this the most of any expansion franchise in MLB and its first since winning the 1986 World Series. Although the Yankees were in the midst of a dynasty and not far removed from their dominant 114-win 1998 season, the 2000 season was their weakest performance since 1995. They won just 87 games in the regular season and lost 15 of their last 18 games, closing 2000 with a seven-game losing streak. Many players who were great in 1998 (Tino Martinez, Paul O'Neill, Scott Brosius, Chuck Knoblauch, and David Cone, had below-average seasons in 2000. The Mets would beat the 97-game winning San Francisco Giants in the NL Division Series, 3–1, and the 95-game winning St. Louis Cardinals, 4–1, in the NL Championship Series. 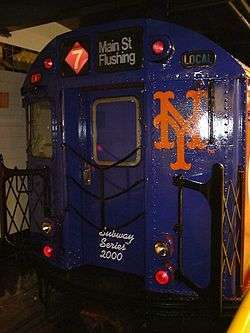 The 2000 World Series was the first World Series appearance for the Mets since their championship in 1986 and their second post-season appearance since 1988. The opener fell on two anniversaries. Twenty-five years prior, Boston Red Sox catcher Carlton Fisk ended Game 6 of the 1975 World Series with his famous home run off the left field foul pole in Fenway Park in Boston to beat the Cincinnati Reds and force a Game 7. Twenty years prior the Philadelphia Phillies won their first World Series title, defeating the Kansas City Royals in six games. Game 1 was a match-up between postseason veterans Al Leiter and Andy Pettitte. Both starters pitched scoreless until the sixth inning when David Justice's two-run double put the Yankees on top. In the top half of the seventh, Pettitte would quickly lose the lead on a barrage of hits, the last by Edgardo Alfonzo to put the Mets on top. However, the Yankees would rally to tie the game on Chuck Knoblauch's sacrifice fly against Mets closer Armando Benítez. José Vizcaíno would drive in Tino Martinez in the twelfth inning with his fourth hit of the game to win it for the Yankees. In Game 2 Roger Clemens started for the Yankees. Earlier in the year during regular season Interleague play, Clemens had hit Mets catcher Mike Piazza in the head with a fastball that resulted in Piazza getting a concussion and going on the disabled list. Game 2 still saw its share of controversy with Clemens and Piazza. Early in the game during Piazza's first at bat, Clemens pitch had shattered Piazza's bat. The ball went foul, but a sharp edge of the bat came towards Clemens. Clemens came off the mound and threw the bat towards the baseline, almost hitting the running Piazza. Piazza was baffled by Clemens' actions and many lambasted Clemens for them. Clemens, after the game, explained himself saying he did not see Piazza running and threw the bat because he was pumped up with nervous energy and initially charged the incoming broken bat, believing it to be the ball at first. Piazza hit a home run off reliever Jeff Nelson later in the game, but in the end the Yankees came away with a 6–5 win. The Mets broke open a 2–2 tie in the eighth inning to go ahead and eventually win the game. This ended the Yankees' fourteen-game winning streak in World Series play dating back to the 1996 World Series. After snapping the Yankees' 14-game winning streak in the World Series against postseason veteran Orlando Hernandez in Game 3, some analysts predicted that the tide had changed, that the Mets (down 2–1 in the Series) were now geared with enough momentum to make a comeback. Those fancies ceased literally after the first pitch, which Jeter hit far into the left field bleachers to put the Yankees on top. It was the sixteenth lead-off homer in World Series history, and incidentally marked a thirteen-game hitting streak in the World Series for Jeter. The Yankees never relinquished their lead following this home run. They secured a dominant 3–1 lead in the Series, with elite pitchers Andy Pettite and Roger Clemens poised for Games 5 and 6 (if necessary). With this win, the Yankees had effectively killed all hope for the Mets. A now-iconic moment in Yankees lore, footage of Jeter's lead off home run, currently serves as the background for the title screen of YES Network's Yankeeography series. Looking to clinch, the Yankees scored first on a Bernie Williams solo home run in the second inning. However, the Mets responded with two unearned runs off Andy Pettitte in the bottom of the inning. In the top of the sixth, Derek Jeter homered to tie the game at 2–2. The Series effectively ended in the top of the ninth. Mets ace Al Leiter had a pitch count that was approaching 140, but manager Bobby Valentine insisted that he would live or die with Leiter. Yankee infielder Luis Sojo hit a two-out single off Leiter, and the throw from center field hit baserunner Jorge Posada as he was sliding into home plate. The ball went into the Yankees' dugout, allowing Scott Brosius to score, as well, and Luis Sojo to take third base, putting the Yankees on top 4–2. In the bottom of the ninth, the Mets' best hitter Mike Piazza dramatically faced the Yankees' closer Mariano Rivera as the tying run with two outs. Piazza hit a deep fly ball, but it was caught in the deepest part of the ballpark by Bernie Williams to end the game at exactly midnight to give the Yankees their third straight world title and fourth in five years. "It was probably the most scared I've been when Mike hit that ball ... I screamed, 'No!' Because any time he hits a ball in the air, it's a home run in my mind. I saw Bernie trotting over for that. I said, 'Wow! I guess I misread that one.' "
↑ The 1997 Indians won 86 games, the 1987 Twins won 85 games, and the 1973 Mets won 82 games. ↑ "2000 World Series". Baseball-Reference. Retrieved January 6, 2014. ↑ "2000 World Series Game 1 - New York Mets vs. New York Yankees". Retrosheet. Retrieved September 13, 2009. 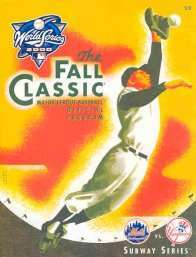 ↑ "2000 World Series Game 2 - New York Mets vs. New York Yankees". Retrosheet. Retrieved September 13, 2009. ↑ "2000 World Series Game 3 - New York Yankees vs. New York Mets". Retrosheet. Retrieved September 13, 2009. 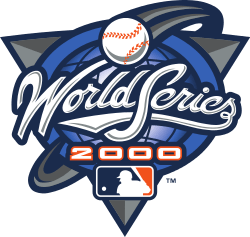 1 2 "2000 World Series Game 4 - New York Yankees vs. New York Mets". Retrosheet. Retrieved September 13, 2009. ↑ "2000 World Series Game 5 - New York Yankees vs. New York Mets". Retrosheet. Retrieved September 13, 2009. ↑ "Sports - Champions belong in any discussion of greatest teams - Seattle Times Newspaper". ↑ "Timeless Sport's Final Moments". The New York Times. November 3, 2009. ↑ "Rivera and Rest of Pen Did Job When Needed". The New York Times. October 27, 2000. ↑ "Mariano meets with Mets fans, employees". ↑ "Yanks' fans celebrate as Mets' mourn". USA Today. October 27, 2000. p. 6C. Briefly: Members of the New York Mets' 1986 World Series champions—catcher Gary Carter, first baseman Keith Hernandez, outfielders Lenny Dykstra and Mookie Wilson and pitcher Ron Darling—took part in the ceremonial first pitch. ↑ Graves, Gary (October 27, 2000). "Mets invoke grit of 1986 champs.". USA Today. ↑ Salisbury, Jim (October 27, 2000). "Ex-Phillie Dykstra Still a Mets Dude". Philadelphia Inquirer. p. D1. ↑ Zipay, Steve (October 26, 2000). "Going Yard, Off Guard". Newsday. 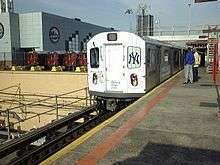 ↑ "Subway Series is lowest-rated Fall Classic in history". CNN. ↑ "2000 Yankees World Series Collector's Edition". Home Theater Forum.